As you may know, I have now finished my second book, but I have not yet explained the circumstances that lead up to it. Here’s how it happened. When I decided to publish Carb Wars, I joined the International Association of Culinary Professionals. I decided to go to their 2007 convention in Chicago since any members with new books were eligible to participate in their annual book expo. It was there that a chance encounter on an elevator led to a book contract with a major non-profit organization. It couldn’t have been more than a two-minute ride, shared by a handsome young man wearing a name tag that said “ADA” on it. I don’t remember our conversation, but I do remember that I told him, “I need to talk to you.” He replied politely that we should get together for a chat. We exchanged business cards and he got off at his stop. I saw him once in the crowd and waved to him, but I thought that was the end of it. The following Fall I received an e-mail from the gentleman I met in the elevator, the Director of Book Publishing for the American Diabetes Association, asking if I would be attending the next convention in New Orleans. I had planned to go since my sister lives there and I had been promising to visit her. He asked if I would meet with him there and we set up a time. I honestly had no idea what he wanted to talk to me about. At the convention, he invited me to submit a proposal to write a low-carb, menu-style cookbook for the ADA. When I picked my jaw up off the floor, I said, “Do you know who I am? I use butter. I use lard. I don’t do low-fat.” He replied, “Well, are you interested or not?” I was skeptical from the start because the ADA had never supported low-carb diets. When I mentioned that, he said simply, “It’s time.” I knew they had recently added a low-carb option “for weight loss, for one year” to their guidelines, so I guessed that they wanted a book for those who chose to try the system. How could I refuse the opportunity to be part of such a historic event? I could have flown home without a plane. I consulted with some of the leading low-carb doctors who specialize in diabetes, read all the books I could find on the subject, and selected a target range of 20 to 50 grams of carbohydrates a day for my menus. In this range, the metabolism switches from burning sugar to burning fat, a beneficial state for those whose bodies cannot handle carbohydrates. In July of ‘08, I sent in a long proposal, including 15 sample recipes with complete nutrition counts because I wanted to give them an accurate preview of what a book from me would be like. I tried to keep my expectations low so I wouldn’t be disappointed when the rejection came. In September, I heard that the board had approved my proposal and I started writing and developing recipes (although I had actually been working on it since January, just in case). I sent in the first batch of material on schedule on October 15, 2008. I wrote up a blog post to tell the world that the ADA was going to publish a real low-carb cookbook, but then I had second thoughts and decided to wait to see if it was really going to happen before I announced it. Until I saw some change in their guidelines, I would not be convinced that they were actually going to endorse the low-carb lifestyle. Over the next 15 months, I sent in 11 batches of material with nutrition counts for every recipe. I asked for feedback several times to see if they were happy with what I was doing. The only response I got was, “It looks like you are doing what we asked you to do.” The final installment was submitted in January of 2010. They assigned me an editor and designed a cover for the book. In fact, you could actually pre-order it from the McGraw-Hill website. At this point, I was beginning to believe it was a real possibility. But I still had misgivings; for one thing, the cover design they sent me was beautiful, but it showed a plate of lean chicken and plain broccoli. I asked if they could depict something that was actually in the book instead because their picture looked like austere diet food, not at all like one of my menus. Soon after, I got a conference call from the director of publishing and the editors saying they wanted me to “make some changes.” They said I would have to change the recipes to comply with the ADA’s current guidelines. * I argued that they had asked me to write a low-carb book; the ADA’s current guidelines are low-fat and the two are NOT compatible. A true low-carb diet would normalize blood sugar levels, reduce or eliminate medications, and prevent or reverse all the complications of diabetes. The director said that he agreed with me (his actual words were, “I don’t disagree with you”) but that he was “stuck” with the current guidelines. Either I revised the book or they could not publish it. I said no. He told me he thought I had written a good book and that he could suggest a number of publishers who might be interested in it. He offered to write recommendations to them and to return the copyright to me. I was very disappointed to say the least, but not entirely surprised. It makes me sad to think of all the people who will lose their sight, their limbs, and their health because they trust this organization to give them good advice. Change will come, even to the ADA, but not in time for many of them and not in time to help with my project. I was just a little ahead of the curve. Looking on the bright side, I now have a completed book, thanks to all those long days and late nights I put in to make the deadlines. And I’m very pleased with how it turned out. In light of all the new scientific studies and all the recent top-selling books promoting low-carb, I think there is a demand for such a book. So, on to Plan B. Replace butter with corn oil margarine for baking, use non-fat or low-fat versions of cheese, and use fat-free cream and cream cheese. Use only lean meat that has been trimmed of all fat and skin. Limit meat or protein substitutes to 4 ounces per serving. Be sure to include healthy whole grains and non-fat or 1% milk. Reduce or eliminate added salt and use sodium-free bouillon granules (Wyler’s). MALTODEXTRIN, SUGAR, POTASSIUM CHLORIDE, MONOAMMONIUM GLUTAMATE, ONION POWDER, HYDROLYZED (SOY AND WHEAT GLUTEN) PROTEIN, CHICKEN FAT, GARLIC POWDER, SILICON DIOXIDE, SOYBEAN OIL, NATURAL FLAVORS, GROUND CELERY SEEDS, SPICES, CHICKEN POWDER, AUTOLYZED YEAST EXTRACT, YELLOW 5 LAKE, EGG YOLK SOLIDS, PARTIALLY HYDROGENATED SOYBEAN OIL, THIAMIN HYDROCHLORIDE, BHA, PROPYL GALLATE, CITRIC ACID (PRESERVATIVES). The first two ingredients are sugar and I recognize at least four euphemism’s for MSG. Three soy products are listed and one is a partially hydrogenated oil. The only meat listed in Wyler’s chicken bouillon is “chicken powder” near the end. Yum. 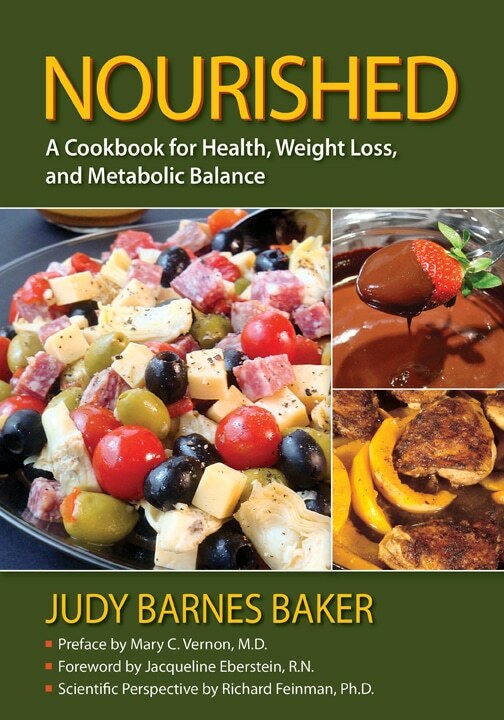 Post Script: The book was published under the title, “Nourished; A Cookbook for Health, Weight Loss, and Metabolic Balance.” It is available as an e-book on Kindle and Nook and as a print book on Amazon. 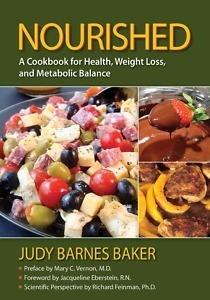 Low-carb book for Am. Diabetes Association, New book. Bookmark. Good for you for sticking to your principles! I fear it will take a another generation of leadership to change the ADA in any meaningful way. The current leadership is still sipping too much of the low-fat "Koolaid", if you get my drift. This is so sad. Someday the ADA will be very sorry it wasn't in the vanguard of good nutrition. Oh no. I was so hoping it would go through. Stupid ADA and their idiotic guidelines. I know you have a great book there Judy and I'm sure someone will pick it up. I'm also very proud of you for sticking to your guns, not that I ever believed you'd handle it any other way. Someday they'll all see the truth – hopefully before too many more people are hurt by their bad advice. I love your first book Carb Wars, and every now and then I check with your blog to see how your new book is doing. What timing that I logged in today! But how disappointing to read that your book won't be published. Judy, stick to your guns. The changes they wanted you to make are ridiculous. It is low carbing that regulates my blood sugar, not using corn oil margarine instead of butter as they recommend! PLEASE keep us updated as to what Plan "B" is that you mentioned. I can't wait to get your second book! Please keep us updated! Anyway, good luck on finding another publisher. Bah! I guess there was a small window of opportunity whilst John Buse was in charge, just not long enough. What a shame. Looks like in the battle between money and science, the money won. Although John Buse didn't achieve much during his time in charge he achieved more than many expected. I fear the small improvements will now be backed out again. Would self-publishing be a good way to go? Sometimes self-published books get picked up by mainstream publishers later.